Michael: Then the progression moves to Dm later. Buud: Can you do the same chord progression with a barre on 5th, 3rd and 1st? Easier to do. sr: What does "barre" mean? 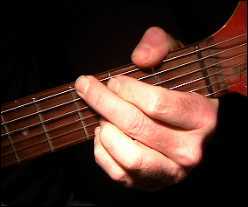 Michael: Using your 1st ( and sometimes other) finger to hold down other strings at the same time. 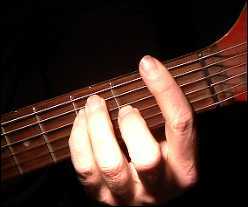 Thus you have a "barre chord." Here's an example of F "not barred" and "barred." 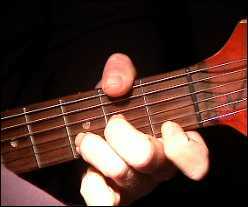 Michael: Notice in this lick you start with the relative pattern on the 10th fret and then you jump into the A Minor Pentatonic scale pattern on the 5th fret. The second section of the lick jumps to a # 7 note, this sets up the sound of the lick, then it uses the minor pentatonic pattern I mentioned earlier. Buud: On lick one, there's some vibrato on that first A note right? Michael: You can take advantage of using various related patterns in a solo, Carlos is a great example of jumping to pattern to pattern within a melodic context. Michael: Notice how you play this lick over the F portion of the progression, this allows any vocals to sing over the majority of the progression and then the guitar jumps in with licks in between the phrasing. sr: It's like different "colors". Or different shades of a color. 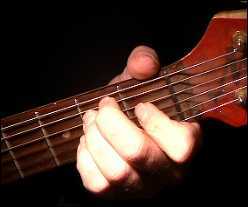 Michael: We're in a related pattern, this time though we alter a bit, however this is actually the E Phrygian. Michael: It does have a nice Spanish sound. 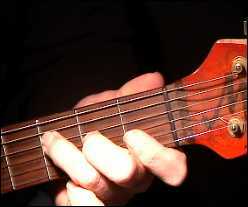 Here's the E Phrygian pattern. 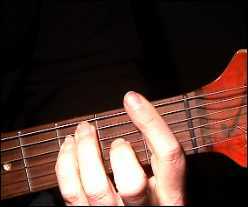 Michael: Notice the arpeggio at the beginning, you can rake your pick downwards on that section. 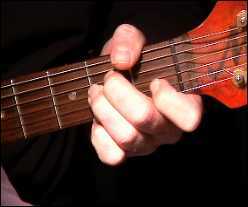 Michael: Notice how you jump from pattern to pattern on this lick. chaz: 50 years I have been fooling with guitar and these lessons are my salvation so thank you very much stay well! Michael: That's great to hear chaz! See you next lesson!